What key changes do you make to your drinks offer ahead of summer? The Castle Tavern prides itself on being a real ale pub and with six dedicated taps in our main bar, our summer ale offer has been carefully selected from local Scottish breweries. This summer, patrons can enjoy some award-winning ales such as Red Rocker, Hit The Lip and the aptly named Sunshine on Keith. As for our wine list, to keep up with demand we have added more rosé and white wine choices. We find that wine with light fruity notes, cider and fruit cider are very popular choices over the summer. In what ways do your customers’ tastes change when the temperature picks up? As the temperature increases, we feel that people tend to look for a beverage that is light, something thirst quenching and, of course, enjoyable to sip on under the warm sunshine. Here at the Tavern, we serve extra cold lager; this includes the full range from Carlsberg, Tuborg, San Miguel alongside craft lager like Innis & Gunn and European wheat beer, Erdinger. Have you noticed a demand for seasonal cocktails in your venue? Our main offering is our wide selection of real cask ales and lager, we do not have a cocktail menu as such but we do have a wide selection of gin and whisky to choose from. Most of the gin we offer is proudly sourced from Scottish distilleries using botanicals grown in their very own region. The gin is paired with Fever-Tree tonics and complemented with various garnishes, including summer fruits. If malt whisky is more to their taste, our customers can have their pick from more than thirty whisky brands on our menu. What tips would you give an operator looking to tweak their drinks list for summer? We would recommend for them to offer drinks that are light in feel and taste – perhaps drinks that incorporate seasonal fruits and flavours. How do you utilise your outdoor area to greatest effect when the sun is shining? We have an exciting summer food menu to enhance the sunny al fresco experience, looking out on the great view of the famous Inverness Castle and the beauty of the River Ness. We are conveniently located next to the start/end of the Great Glen Way and have hosted many a tired and hungry adventurer with their bikes and backpacks coming in for a well-deserved meal and drink. What occasions throughout the summer can licensees look to take advantage of? 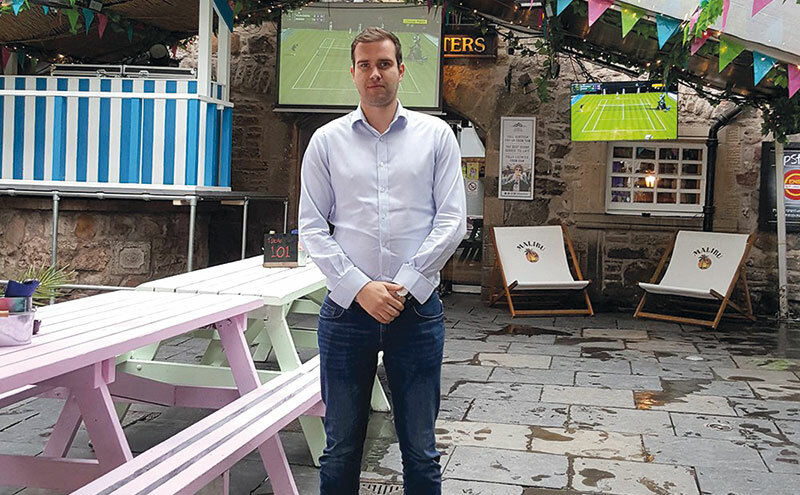 We have multiple TV screens throughout the bar and restaurant and we are looking forward to being able to show big sporting events this summer, such as Wimbledon and the World Cup. It is our pleasure to be able to provide a venue for people to come together and enjoy the action outdoors, all throughout the summer season. How important is it to get ready quickly for a rush to beer gardens in the wake of some unexpected sun? 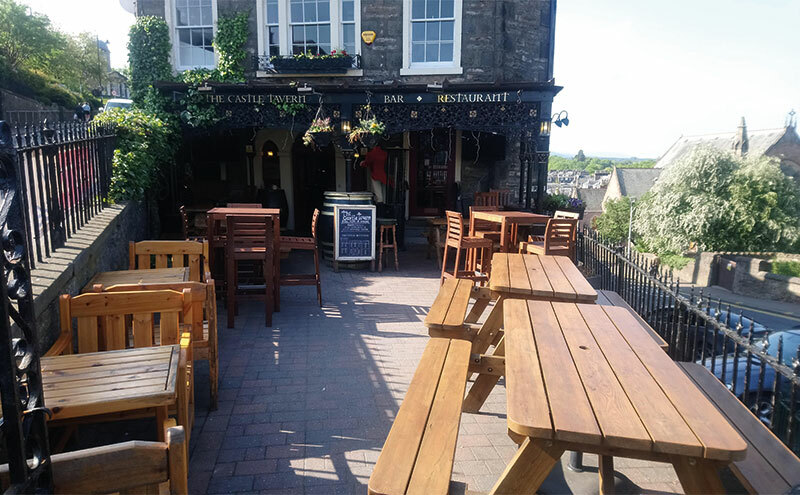 Our beer garden along with the canopy area are open all year round and with one of the best views in Inverness, we feel that preparation is important. We have table umbrellas as well as large heaters for the comfort of our guests at the beer garden. Scottish weather is unpredictable, but the views from The Castle Tavern can be enjoyed no matter the weather; if not in the beer garden, customers have the choice to come into the cosy bar indoors or to our first-floor restaurant, which has elevated views of Inverness Castle. One of the main changes to our drinks offer for the summer over the past two years has been the introduction of iced cocktail slushies. These are perfect summer drinks. We rotate the slushies that we have on offer to keep it fresh. They’re not only a great product but a great visual draw for customers too. Once one goes out over the bar dozens follow. Summer is the perfect time to introduce a range of cocktails which we push throughout weekends and key events we host. One of our shipping containers has a fully kitted out cocktail bar where you can enjoy a variety of cocktails. The theme of the bar is rotated on a monthly basis. This month coming we’re offering a range of Latin-style cocktails consisting of Mojitos, Margaritas and flavoured Daiquiris. The biggest trends that are apparent in the summer are the uplift in cider, gin and bottled beers sales. As soon as the sun is out everyone is desperate for a bottle of Kopparberg or a pint of Magners. I find that visual impact is a great way of pushing sales. If your POS and drinks presentation are eye catching then drinks will flow. The courtyard is the heart of the Three Sisters. Every foot of space is used to effect. We currently house five shipping containers, each of which offers a different style of street food and paired drinks offers. We like to showcase our amenities through events that are hosted throughout the year. We are currently in the middle of Cowgate Pleasure Beach, which is running for two weeks. The event will consist of DJs playing in the courtyard every night, themed street food and drinks, Blackpool-style decorations and a weekly cinema event on our 225” screen. This is the most important part of the week. We work on a tight schedule of planning so the venue is always poised for busy periods. This goes down to careful considerations, which range from rotas to stocking. Being ready to go is of the highest importance.